I enjoyed a conversation with a 70 year old Indiana Amish farmer who said, Americans need to do some hard work on the farm to build character. 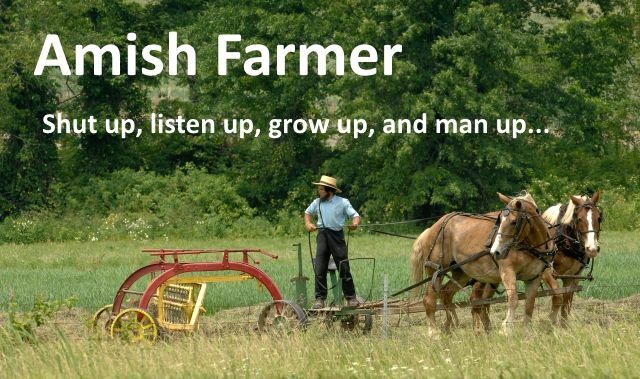 Yesterday, I had the good fortune to hear from an Amish Farmer here in Indiana, "that Americans are too far, too many generations away from the farm." I then told him a macho story for kicks. "Slow down, or I beat you." He understood exactly the point, when another person endangers our life, we need to "man up," and stand up, grow up, and take responsibility for our lives.